If I asked you to identify the biggest trends in beauty right now, I bet that you'd mention one of the following: K-beauty, masking, subscription boxes. Well all three of those things have come together in a fabulous way to form a face mask subscription service called Facetory. I've really gotten into masking over the last year (you may have watched a vlog a while back on my YouTube channel where I visit a brick and mortar Mask Bar in the West Village) but I have to say out of the ones I've tried I kept finding that I preferred clay masks to sheet masks. 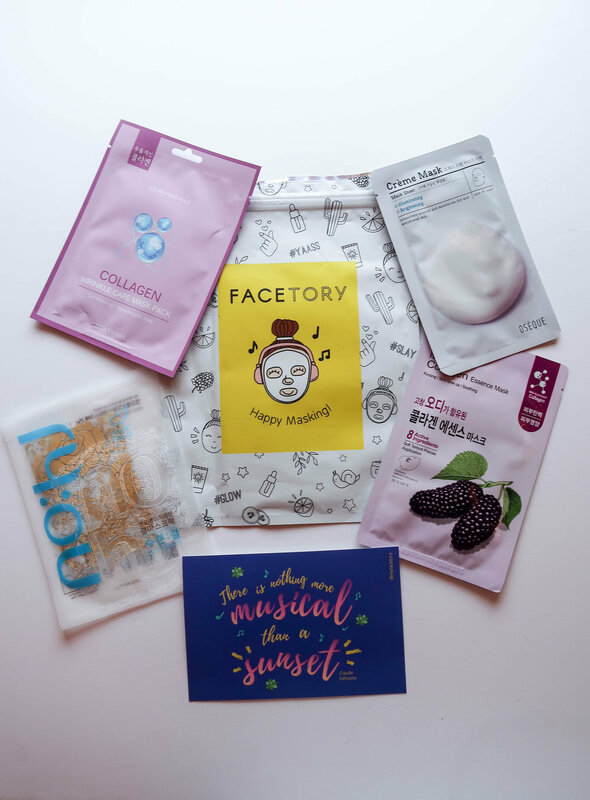 To me a lot of sheet masks felt like they did the exact same thing, so I never remembered one as being particularly amazing compared to another, which is why I wanted to test out Facetory to see if they could prove me wrong. All you have to do is sign up on the Facetory website by clicking the "Subscribe" button at the top. You then have the option to choose a plan. You can either choose the Four-Ever Fresh kit (that's what I did) or the Seven Lux box if you want to get more masks each month. The photos in this post are of the April 2018 box. 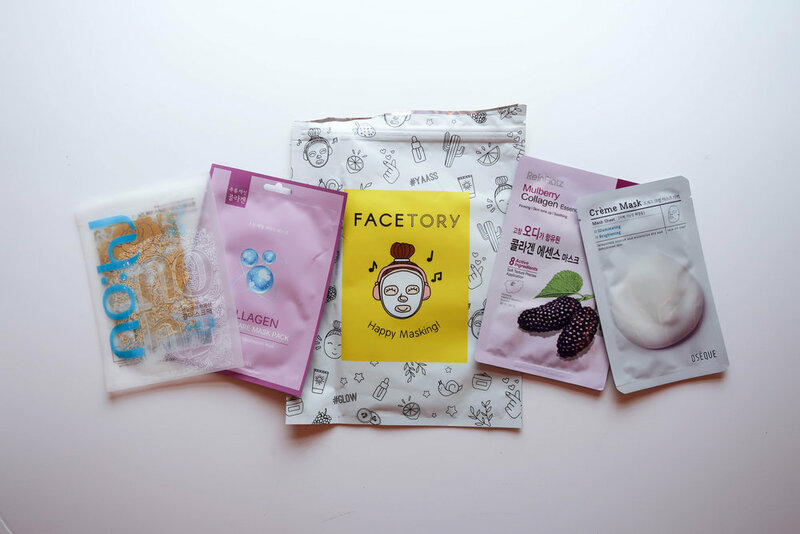 So if you select the Four-Ever Fresh kit like I did, you'll receive four sheet masks at the beginning of the month that are curated by the team at Facetory. Since the masks are all different each month, I'm not going to go into crazy detail about each one that I tried on here but you can see the different masks from the photos in this post. It's also worth noting that if you want to try any individual mask, you can shop them on Facetory's website. My two stand-out masks from this month were the NOHJ 24 Karat Gold one (looks like foil and lace) and the Oseque Creme Mask that was so moisturizing, I skipped my usual nighttime face cream. Each plan has three different pricing options. You can either choose to pay monthly or you can buy six month and twelve month plans. I just went with monthly to start because I wanted to make sure I liked the service which is $5.95/month. This plus $2.95 for shipping came out to $8.90 total. Not bad to spend for a few hand-selected face masks delivered to you each month. If you're like me and don't know your way around a shelf of sheet masks as well as you should, the price makes sense because the work of going to a store and selecting a mask is done for you. As I mentioned earlier, they also sell masks individually on the website. I really enjoyed Facetory and have another order coming for May! As far as value for your money it's pretty good if you like someone else to do the curating for you, but as we know sheet masks can be found on Amazon for $1 each or at a brick and mortar like Mask Bar where they sometimes offer 6 for $10. I'll probably keep it going for another month or two to see how it goes. I will say I really loved the 24K gold mask (which retails individually for $5 so it was worth it to get in the box) and the creme one and I'd be excited to see what other surprises await me. Would you try a face mask subscription service? *This post is NOT sponsored by Facetory.